Your username and password must not be distributed to others. This will result in immediate termination of service. EmploymentCrossing has the right to refuse membership or cancel membership at any time for any reason. Your membership fees are non-refundable. Refunds will be provided for any charges that are not in accordance with the terms of membership and billing procedures described in the terms of membership. Refunds may be provided for other reasons at the sole discretion of EmploymentCrossing. You agree not to reproduce, duplicate, copy, sell, resell, or exploit for any commercial purposes any portion of the Service, use of the Service, or access to the Service. The material on the Service is for the private, non-commercial enjoyment of members only. Any other use is prohibited. For employer members, EmploymentCrossing currently provides employer members several monthly plans that allow the employer to post jobs and access resumes of job seeking members of EmploymentCrossing. While EmploymentCrossing makes every effort to only list jobs which employers may want those in the industry-specific community to know about, we are not responsible for the accuracy of our jobs and/or the contact information for those jobs and any consequences to our users that may follow from them applying to given jobs listed on the EmploymentCrossing website. The inclusion of links on this site does not constitute an endorsement of the employer or a guarantee that a job even exists with a given employer. 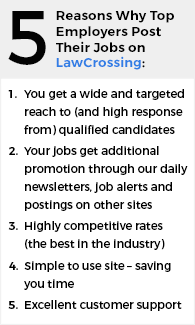 EmploymentCrossing assumes no liability whatsoever for the quality or legality of the jobs posted on its site or whether or not employers are actually able to hire a candidate in response to a given job listing. Furthermore, EmploymentCrossing does not censor any position offered, including but not limited to the identity of the employer. EmploymentCrossing assumes no liability for the quality, legality, or accuracy of resumes, cover letters, supporting materials or its assistance in transmitting any of this information to an employer member. This site is for informational purposes only. The materials and information found on this site are provided "as is," without warranty of any kind, either express or implied, including without limitation any warranty for information, services, or products provided through or in connection with this site and any implied warranties of merchantability, fitness for a particular purpose, expectations of privacy, or non-infringement. EmploymentCrossing does not warrant that the functions of the site will be uninterrupted or error-free, that defects will be corrected, or that this site or the server that makes it available are free of viruses or other harmful components. EmploymentCrossing does not warrant or make any representations regarding the use or the results of the use of the materials in this site in terms of their correctness, accuracy, reliability, or otherwise. Applicable law may not allow the exclusion of implied warranties, so the above exclusion may not apply to you. This disclaimer of liability applies to any damages or injury caused by any failure of performance, error, omission, interruption, deletion, defect, delay in operation or transmission, computer virus, act of God/act of nature, communication line failure, theft or destruction or unauthorized access to, alteration of, or use of record, whether for breach of contract, tortious behavior, negligence, or under any other cause of action. AS AN EMPLOYMENTCROSSING MEMBER, YOU WILL BE BILLED FOR A MEMBERSHIP IN ACCORDANCE WITH EMPLOYMENTCROSSING'S MEMBERSHIP FEE. IF YOU ARE A MONTHLY SUBSCRIBER, AS OF THIS DATE THE MINIMUM MEMBERSHIP FEE IS $199 PER MONTH BUT MAY BE MUCH HIGHER. YOU WILL BE AUTOMATICALLY BILLED EACH MONTH, UNTIL AND UNLESS YOU CONTACT US BY TELEPHONE TO CANCEL YOUR MEMBERSHIP. YOU HAVE A RIGHT TO CANCEL WITHOUT CHARGE AT ANY TIME DURING THE THREE (3) DAY FREE TRIAL PERIOD. AFTER THE TRIAL PERIOD, YOU MAY CANCEL YOUR MEMBERSHIP AT ANY TIME, BUT YOU WILL NOT BE ENTITLED TO A REFUND FOR ANY UNUSED PORTION REMAINING ON YOUR ACCOUNT. YOU MUST CANCEL BEFORE YOUR NEXT BILLING DATE IN ORDER TO AVOID A CHARGE FOR THE FOLLOWING MONTH-LONG PERIOD. IF YOUR BILLING DATE FALLS ON A WEEKEND OR LEGAL U.S. HOLIDAY, IT IS YOUR RESPONSIBILITY TO CALL ON A WEEKDAY PRIOR TO YOUR BILLING DATE. YOUR BILLING DATE REFLECTS THE DATE YOUR MEMBERSHIP WITH EMPLOYMENTCROSSING WAS INITIATED. YOU MAY CANCEL YOUR MEMBERSHIP WITH EMPLOYMENTCROSSING BY CALLING US AT (800) 680-7345 BETWEEN THE HOURS OF 8:00 A.M. AND 4:00 P.M. (PACIFIC STANDARD TIME), MONDAY THROUGH FRIDAY (EXCLUDING HOLIDAYS), AND SPEAK WITH ONE OF OUR CUSTOMER SERVICE REPRESENTATIVES TO TELL US YOU NO LONGER WISH TO BE CHARGED FOR THE SERVICE. EMPLOYMENTCROSSING PRESERVES THE RIGHT TO CHANGE THE MEMBERSHIP FEES AT ANY TIME. YOUR SUBSCRIPTION TO EMPLOYMENTCROSSING WILL BE AUTOMATICALLY RENEWED EVERY MONTH, UNLESS EMPLOYMENTCROSSING IS NOTIFIED BY PHONE. UNTIL YOU TERMINATE YOUR MEMBERSHIP, YOU AUTHORIZE OUR BILLING COMPANY (VERISIGN) TO CHARGE YOUR CREDIT CARD (OR OTHER APPROVED FACILITY OR MECHANISM) FOR THE ONGOING SUBSCRIPTION FEE. WHEN YOU SIGN UP FOR EMPLOYMENTCROSSING WITH A PROMOTION CODE THAT OFFERS FREE ACCESS FOR A SPECIFIED PERIOD, YOUR CREDIT CARD WILL NOT BE CHARGED FOR THE SPECIFIED PERIOD, ALLOWING YOU FREE AND UNLIMITED ACCESS DURING THAT PERIOD. IF THE PROMOTION REQUIRES YOU TO SUBMIT PAYMENT INFORMATION, YOUR CREDIT CARD WILL BE CHARGED ON THE DAY IMMEDIATELY FOLLOWING THE END OF THE SPECIFIED PERIOD, UNLESS YOU CALL US DURING THE PROMOTION PERIOD TO CANCEL AS DESCRIBED IN THIS PARAGRAPH, AND YOU WILL CONTINUE TO BE BILLED THEREAFTER IN ACCORDANCE WITH THE TERMS OF YOUR SUBSCRIPTION. FOR EXAMPLE, IF YOU SIGN UP WITH THE 3-DAY FREE TRIAL OFFER, YOU WILL BE BILLED THE PERIODIC FEE ON THE 4TH DAY, AND WILL CONTINUE TO BE BILLED THE PERIODIC FEE EACH BILLING PERIOD THEREAFTER. ANY FREE TRIAL OFFER ASSOCIATED WITH EMPLOYMENTCROSSING ENTITLES NEW SUBSCRIBERS TO A ONE-TIME FREE TRIAL USAGE OF THE SERVICE. BY SIGNING UP FOR EMPLOYMENTCROSSING WITH A PROMOTION CODE OFFERING FREE ACCESS FOR A SPECIFIED PERIOD AND SUBMITTING PAYMENT INFORMATION, YOU SPECIFICALLY AUTHORIZE US TO CHARGE YOUR CREDIT CARD FOR THE PERIODIC FEES UNDER WHICH YOU HAVE SIGNED UP, BEGINNING IMMEDIATELY AFTER THE END OF THE SPECIFIED PROMOTION PERIOD. IF YOU WISH TO TERMINATE THE TRIAL AND DO NOT WISH TO BE BILLED ON A RECURRING BASIS, YOU MUST CALL TO CANCEL BEFORE THE END OF YOUR TRIAL PERIOD, AS DESCRIBED ABOVE. Please inform EmploymentCrossing of any of the following changes in your credit card or debit account: Change in home or billing address or other contact information; card loss or theft or unauthorized usage of the card; or apparent breach of security of username or password, such that unauthorized access to the EmploymentCrossing service via the card is possible. Unless you give proper notice to EmploymentCrossing of any such event, you agree to pay all charges for unauthorized use of the service. In addition, EmploymentCrossing shall not be responsible for any bank overdraft fees, charges for exceeding credit limits, or any other fees or charges that may be imposed by your bank or credit card company. If your credit or debit card is declined for any reason, you will be sent an invoice for the amount due, and you agree to pay that invoice. UNDER NO CIRCUMSTANCES, INCLUDING BUT NOT LIMITED TO NEGLIGENCE SHALL EMPLOYMENTCROSSING BE LIABLE FOR ANY SPECIAL OR CONSEQUENTIAL DAMAGES THAT RESULT FROM THE USE OF, OR THE INABILITY TO USE, THE MATERIALS IN THIS SITE, EVEN IFEMPLOYMENTCROSSING OR ITS AUTHORIZED REPRESENTATIVE HAS BEEN ADVISED OF THE POSSIBILITY OF SUCH DAMAGES. APPLICABLE LAW MAY NOT ALLOW THE LIMITATION OR EXCLUSION OF LIABILITY OR INCIDENTAL OR CONSEQUENTIAL DAMAGES, SO THE ABOVE LIMITATION OR EXCLUSION MAY NOT APPLY TO YOU. IN NO EVENT SHALL EMPLOYMENTCROSSING'S TOTAL LIABILITY TO YOU FOR ALL DAMAGES, LOSSES, AND CAUSES OF ACTION (WHETHER IN CONTRACT, TORT, OR OTHERWISE) EXCEED THE AMOUNT PAID BY YOU, IF ANY, FOR ACCESSING THIS SITE. You, and not EmploymentCrossing, are entirely responsible for all content that you upload, post, email, or otherwise transmit via EmploymentCrossing. The information on EmploymentCrossing is provided by EmploymentCrossing, various users of the service, and outside parties, and EmploymentCrossing does not guarantee the accuracy, integrity, tastefulness, or quality of such information. You acknowledge and agree that EmploymentCrossing may preserve your personal information and may also disclose this personal information if required to do so by law or in the good-faith belief that such preservation or disclosure is reasonably necessary to: (a) comply with legal process; (b) enforce the terms of service; (c) respond to claims that any of this personal information violates the rights of third parties; or (d) protect the rights, property, or personal safety of EmploymentCrossing, its users, and the public. EmploymentCrossing neither endorses nor is responsible for the accuracy or reliability of any opinion or statement made on EmploymentCrossing. Under no circumstances will EmploymentCrossing be liable for any damage caused by reliance on information obtained through EmploymentCrossing. It is your responsibility to evaluate the accuracy, completeness, and usefulness of any opinion, advice, or other information available through EmploymentCrossing. Please seek the advice of professionals as appropriate regarding the evaluation of any specific information, opinion, or other content. Recognizing the global nature of the Internet, you agree to comply with all local rules regarding online conduct and acceptable information. Specifically, you agree to comply with all applicable laws regarding the transmission of technical data exported from the United States or the country in which you reside. You agree not to reproduce, duplicate, copy, sell, resell, or exploit for any commercial purposes any portion of EmploymentCrossing, use of EmploymentCrossing, or access to EmploymentCrossing. Only one person may access any EmploymentCrossing website at any given time using the same username and password, unless we agree otherwise in writing. EmploymentCrossing reserves the right to immediately revoke your account and/or assess a $10,000 daily penalty for copying any copyrighted text from our sites or otherwise misusing or misappropriating any site content, including but not limited to use on a "mirrored," competitive, or third-party site. You acknowledge that EmploymentCrossing may establish general practices and limits concerning use of EmploymentCrossing, including without limitation the maximum number of days that information pertaining to you or other uploaded content will be retained by EmploymentCrossing, the maximum number of email messages that may be sent from or received by an account on EmploymentCrossing, the maximum size of any email message that may be sent from or received by an account on EmploymentCrossing, the maximum disk space that will be allotted on EmploymentCrossing's servers on your behalf, and the maximum number of times (and the maximum duration for which) you may access the Service in a given period of time. You agree that EmploymentCrossing has no responsibility or liability for the deletion of or failure to store any messages and other communications or other Content maintained or transmitted by the Service. Notices to you may be made via either email or regular mail. EmploymentCrossing may also provide notices of changes to EmploymentCrossing or other matters by displaying notices or links to notices to you generally on EmploymentCrossing. EmploymentCrossing, the EmploymentCrossing logo, trademarks, and service marks, and other EmploymentCrossing logos and product and service names are trademarks of EmploymentCrossing (the "EmploymentCrossing Marks"). Without EmploymentCrossing's prior permission, you agree not to display or use in any manner the EmploymentCrossing Marks. attempting to decipher, decompile, disassemble, or reverse engineer any of the software comprising or in any way making up a part of this Site. EmploymentCrossing may provide its valued members the opportunity to register for account updates, news, and marketing information delivered via text messaging and other wireless devices such as mobile phones. You may provide your consent to receive such information from EmploymentCrossing either when registering on this website or by contacting us at any time. The relevant information requested as part of your online registration process is your telephone number or a wireless email address, but only if specifically requested, and the carrier's name. Members who register for EmploymentCrossing's wireless marketing services acknowledge, understand, and agree that they will likely be charged by the user's wireless carrier for all messages sent to the user from EmploymentCrossing. Standard messaging rates will apply unless noted otherwise. Under no circumstances will EmploymentCrossing or any of its affiliates be responsible for any wireless email or text-messaging charges incurred by a member or by a person who has access to a member's wireless device, telephone number, or email address. You hereby understand, acknowledge, and agree that EmploymentCrossing may, in its sole discretion and without liability to any member, terminate any of its specific wireless update services or all wireless update services at any time without advance notice. EmploymentCrossing may provide notice of termination or changes in services on this website. You hereby warrant and represent that you are at least eighteen (18) years of age (21 in some jurisdictions) and have the legal capacity to enter into agreements of this nature. EmploymentCrossing makes no representation or warranty that the content published on this site complies with the local laws of your jurisdiction. You are solely responsible for knowing and understanding your local laws concerning standards of content legality. You further represent and warrant that you understand the nature of the content published on this site, namely information about positions, and that you voluntarily and knowingly choose to view such material. Should you be unable to affirmatively make the representations and warranties contained herein, do NOT subscribe to this Service. Any Associated Press text, photo, graphic, audio, and/or video material appearing on the site shall not be published, broadcast, rewritten for broadcast or publication, or redistributed directly or indirectly in any medium. Neither these AP materials nor any portion thereof may be stored in a computer except for personal and non-commercial use. AP will not be held liable in any way to the User or to any third party or to any other person who may receive information in the Service or to any other person whatsoever for any delays, inaccuracies, errors, or omissions there from or in the transmission or delivery of all or any part thereof or for any damages arising from any of the foregoing or occasioned thereby. The failure of EmploymentCrossing to exercise or enforce any right or provision of these terms of service shall not constitute a waiver of such right or provision. If any provision of the terms of service is found by a court of competent jurisdiction to be invalid, the parties nevertheless agree that the court should endeavor to give effect to the parties' intentions as reflected in the provision, and the other provisions of the terms of service remain in full force and effect. You agree that regardless of any statute or law to the contrary, any claim or cause of action arising out of or related to use of EmploymentCrossing or the terms of service that you may have must be filed within one (1) year after such claim or cause of action arose or be forever barred.